The fresh, citrus marinade in this recipe is what makes the smoked venison tenderloin turn out so good. It’s really citrus forward, which is great for venison because it’s such a rich, gamey meat. I like to let the venison marinate for at least 4 hours, or overnight. Put the whole venison tenderloin into a zip-style bag or large bowl. Set aside. To make the citrus marinade, add the olive oil, lemon juice, garlic, salt and pepper into a blender or small food processor. Process until it’s all incorporated and the garlic is broken to small pieces. Pour the citrus marinade over the venison, massaging it in. Refrigerate and marinate for at least 4 hours, or up to overnight. When you’re ready to cook, remove the venison from the marinade and rinse it off. Pat the venison dry with paper towels and let it come to room temperature for 30 minutes before cooking. Meanwhile, preheat the smoker. Set and preheat your smoker to about 225 F degrees. 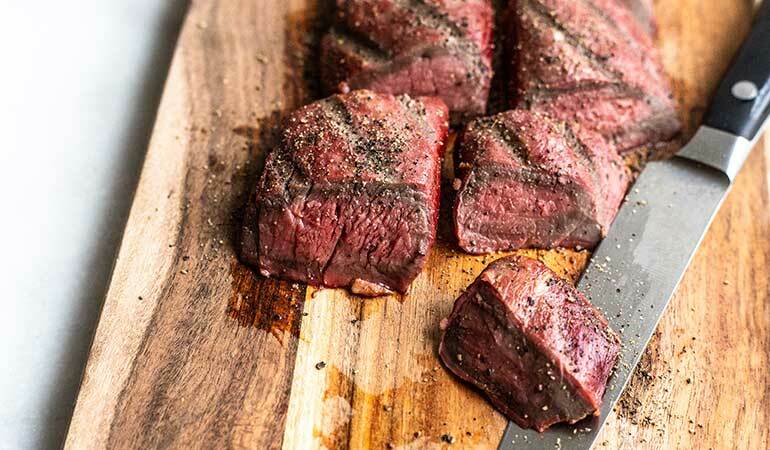 Smoke the venison tenderloin for 1 ½ to 2 hours, depending on the thickness of your meat. The internal temperature should be at 130 F for rare (or 140 F for medium rare). Don’t cook it to medium, if you want your smoked venison tenderloin to be nice and juicy! Remove venison from smoker. Let it rest for 10 minutes before slicing and topping it with extra cracked black pepper. For more venison recipes from Allie Doran, visit Miss Allie’s Kitchen.